King Li, dean of the Carle Illinois College of Medicine, surprises Elizabeth Woodburn with her acceptance package. The dean of the Carle Illinois College of Medicine, Dr. King Li, walks into my research group meeting, and time seems to stop. Could he be here for me? I quickly remind myself he could be here to talk to my research advisor instead. I applied to be a member of the inaugural class of the world’s first engineering-based medical school, but acceptance notifications won’t be issued until tomorrow. It was a moonshot that I knew I had to try for, but I am all set to spend a year working, living with my parents and preparing to apply to more schools. Then Dean Li looks around the room. “I’m looking for Elizabeth Woodburn,” he says. I’ve been thinking about working in healthcare since high school, but I wasn’t sure where that would take me. 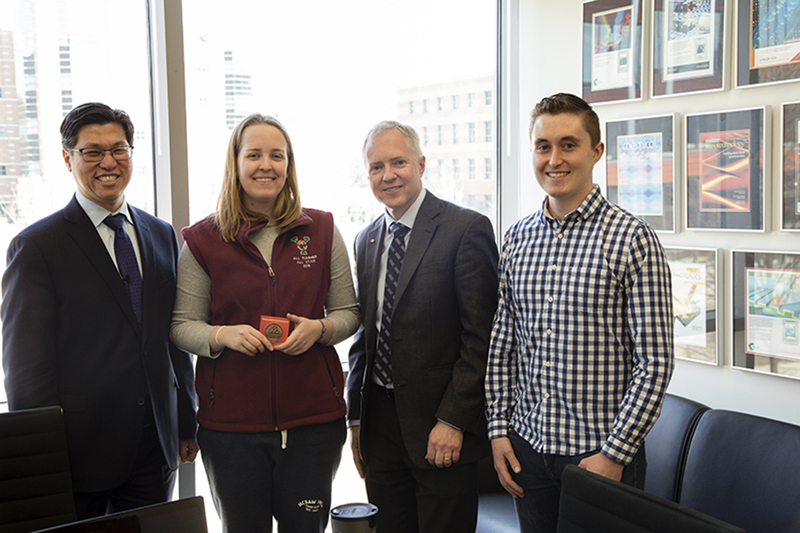 Throughout my time as an undergraduate in bioengineering at Illinois, the faculty kept us informed about developmental milestones along the path toward building a new college that would eventually fuse engineering and medicine in a unique way. 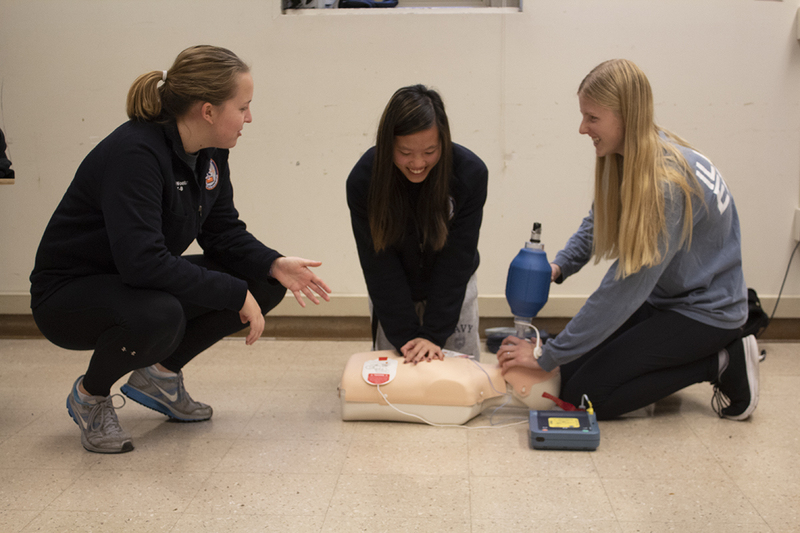 Elizabeth Woodburn, left, teaches a CPR class with Illini EMS. After taking a CPR course as a freshman through Illini Emergency Medical Services, I became very involved in the organization. By senior year, I was supervising the education department as we taught CPR and EMT courses while working to make Illinois a HEARTSafe Campus. I knew then that I wanted to see patients and continue teaching. But having been involved in academic research, I also wanted to be an innovator, which pushed me away from a conventional M.D. program. I planned to take a gap year before attending medical school, but in October they began recruiting for Carle Illinois. Getting to be a part of the first class was too great an opportunity to pass up. Illinois M.D./Ph.D. student Kenny Long was Woodburn’s mentor during her undergraduate research program. His description of medical school helped her realize that she did not want a traditional program. I filled out the online application materials and attended a showcase that gave us a glimpse of the facilities, faculty and curriculum. The small class size and the problem-focused, active learning environment seemed up a lot more up my alley than a traditional program. Then came the secondary application. That was the fun part for me, because it was so different. We picked an artifact to represent each of the four C’s of Carle Illinois – compassion, competence, curiosity and creativity – and wrote 250 words describing each of them. Then we had a video interview. They would show a question on screen for a few minutes, then the webcam would turn on and you’d have a fixed amount of time to answer. I liked that it made for an authentic response, rather than a rehearsed script. Then I wait … until Dean Li knocks on my research group’s door and asks for me. “I’m Elizabeth,” I say, raising my hand. Suddenly, the room is filled with people holding cameras and smiling at me. I’m completely taken aback, but I can tell how excited everyone is to meet their first student. It’s great to feel the energy of everyone in the room. 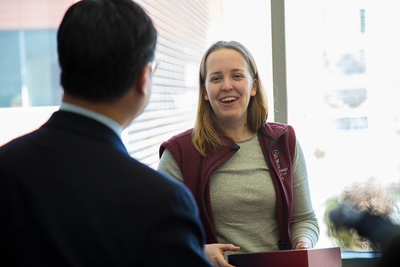 Li surprises Woodburn during a meeting with her research group. From left: Li, Woodburn, Professor Brian Cunningham and graduate student Kenny Long. Dean Li presents my acceptance package. Everyone stares at me, grinning expectantly. I say, “Thanks!” four or five times – I’m so overwhelmed, I can’t think of much else to say! It’s great to have my research mentor in the room. While my head is spinning after the people and cameras leave, he reassures me that yes, it really happened. The only thing I’d change? I certainly would have dressed up more if I had known I’d be on camera today – I'm wearing sweatpants! 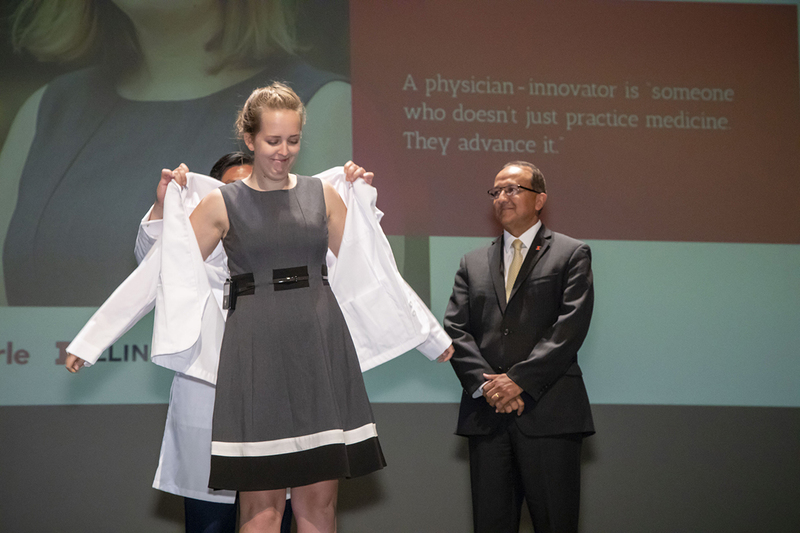 Elizabeth Woodburn receives her white coat, signifying that she is a physician-in-training, from dean King Li and executive associate dean Rashid Bashir during a July ceremony. 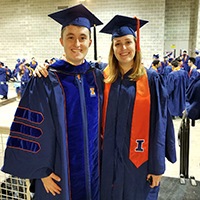 Editor’s notes: This post is the first in a series recounting the experiences of the first class of the Carle Illinois College of Medicine.